Spinfy signs co-operation agreement with Japanese partner - Spinfy - quality content for kids with smart parents! 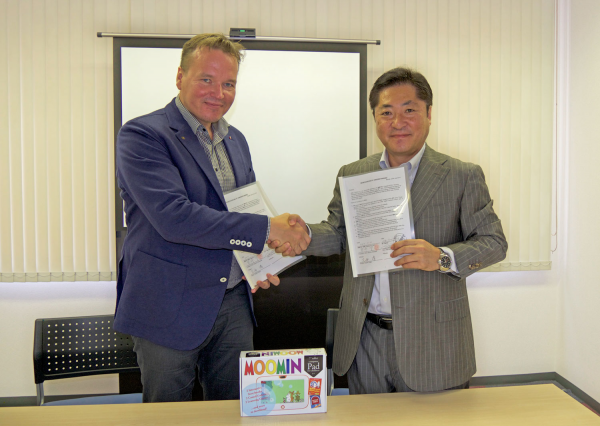 OULU, FINLAND -- SMC Tohoku Co., Ltd. (Sendai, Japan) and Spinfy Oy (Oulu, Finland) signed today a co-operation contract for joint development of Moomin applications. Oy Moomin Characters has previously granted a global license for Spinfy Oy to develop, launch and sell mobile Moomin applications as well as Moomin tablet. Discussions seeking for co-operation between SMC and Spinfy started in June 2014, when SMC visited Oulu as part of business development conference hosted and supported by City of Sendai, Sendai City Industrial Promotion Organization, and the industrial aid agency “Business Oulu”. After some constructive negotiations with Spinfy, letter of intent for developing Moomin app-business together were signed in July in Sendai. During the autumn the final preparations were made and now both parties are ready to start a long-term co-operation around Moomin apps. Moomin is the biggest licensing brand from Scandinavia and one of the most valuable licensing brands globally. Moomins are loved by children, families and young women in various countries of the world, and especially in Japan and Scandinavia the popularity of this brand is exceptional.